Home / How Do Polyamorists Identify Themselves? by Rami Henrich, LCSW & Cindy Trawinski, Psy.D. This is the second in a series of articles about the intersections of polyamorous identities and psychotherapy, adapted from our article in Sexual and Relationship Therapy, “Social and therapeutic challenges facing polyamorous clients” (Henrich & Trawinski 2016). In this installment, we provide an overview of Rami’s research findings, which uncover just how complex and diverse polyamorous identities can be. We focus here on polyamory as a lifestyle and identity rather than sexual orientation for three reasons. First, space constraints prohibit a sufficient discussion of sexual orientation. Second, participants themselves phrased their responses with a language of identity, more so than sexual orientation. Third, from the perspective of Process-oriented Psychology, identity is the individual’s awareness and perceptions from which identity emerges as the fluid expression of experience that is the immediate result of environment, social context, inner states, and personal history.2 Thus, identity provides the lens through which the participants view and the authors understand marginalization. In the following sections, we use participant statements and the authors’ personal experiences to explore these themes. Participants frequently expressed challenges related to their polyamorous identities. Interviews showed that “Do you identify as a polyamorist?” was rarely a simple “yes” or “no” question. Respondents routinely reflected on the meaning of polyamory, who does and does not identify as polyamorous, and why. Three participants identified as polyamorous, three as monogamous, and six were unsure and drew a distinction between being in a polyamorous relationship and having a polyamorous identity. In some polyamorous relationships, all partners identify as polyamorous, and in others, only some do. Partners in asymmetrical poly relationships often wonder if polyamory is circumstantial for them (i.e. they are only in a polyamorous relationship because they love a polyamorist), or if polyamory is something they identify with beyond their current relationship. I don’t consider myself polyamorous, but I am a part of a polyamorous triangle. I am in a loving relationship with one person but she is also in a loving relationship with someone else. I am in a polyamorous relationship because the person I love loves someone else…not because I love more than one person. If you ask me if I were polyamorous, I would say “No?” with a question mark at the end. Crystal considered polyamorous identity as a process and explained that if or when she has a girlfriend in addition to her primary relationship with Wanda, then she would identify as polyamorous. I think [I’m polyamorous] but I’m not sure… I am dating a married man and it is all open and honest… I think that, had my husband been able and willing to be open to my relationship with Paul, I would have continued on with both of them. I don’t have an identity beyond noticing what happens to me… I have this pattern. Every three to five years somebody will show up where I need to pursue this thing of the heart, this very strong uncontrollable attraction. I need to be with that until it resolves itself in some way, and that seems to be my nature, who I am. There is a distinction between someone who is polyamorous and someone who chooses to be polyamorous. It is different … in the sense that you have people who are gay, lesbian, or … honestly bisexual. But if you are bisexual and monogamous, you will end up being straight or queer… Monogamy trumps [bisexuality]. In my life, polyamory trumps everything else, it’s… the first for me. Issues of disclosure and personal identity were important to all participants. 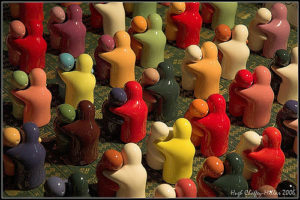 Many identified connections with others in polyamorous communities as crucial support to navigate the complex issues. In addition to disclosure and marginalization, therapists serving polyamorous clients should be prepared to address issues related to personal, sexual, and relational identities. Diamond, Julie & Lee Spark Jones (2004). A path made by walking: Process Work in practice. Portland, OR: Lao Tse Press. Henrich, Rami. (2011). “Following a path of heart: Exploring the psychological, relational and social issues of polyamorists” (Unpublished thesis). Process Work Institute, Portland, OR. Klesse, Christian. (2014). “Polyamory: Intimate practice, identity or sexual orientation?” Sexualities, 17, 81–99. Tweedy, Ann E. (2011). “Polyamory as a sexual orientation.” University of Cincinnati Law Review, 79, 1461–1515.